injured from an unnecessary bombing based on nothing more that a rumor. activities prejudicial to the glowing image of our heroes and to excuse their own criminal behavior. schools, churches, cathedrals and castles were hit only when "enemy soldiers were firing from them"
the skies over Germany were hidden away and free from scrutiny, judgement or condemnation. photos, personal accounts and old newspaper clippings. industrial center of Coventry, England, which resulted in the loss of around 400 civilian lives. of six million homes and "civilian casualties estimated at 900,000". A bit short of his mark in 1941, Portal wrote: "We have caused death and injury to 93,000 civilians. of attempts to hit factories." 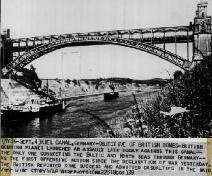 campaign: on the Kiel Canal, Sept. 3, 1939; On Wilhelmshaven, Sept. 4, 1939; on Helgoland, Dec.
success for a change." It destroyed 80% of the city's historic timber-framed core. later stages of the war because of this homicidal, morally corrupt and largely unsuccessful policy. bomb Hamburg in "Operation Gomorrah" and in several later civilian bombings. agonizing manner in a well-crafted firestorm that corralled the population, leaving them no escape. contents on people in such a way that a horrible death was the inevitable outcome. left homeless and 5,000 civilian deaths with women and children making up 81 percent of that figure. 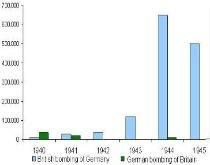 undocumented refugees, were killed from bombings every month in just the western German areas. Command killed three German civilians for every one killed by the U.S.
into total and complete oblivion, confident that this would lead to "victory" within six months. Eisenach, and the rest of Berlin, in other words, all points refugees were flocking to. and implemented to eliminate the future "refugee problem" for their Soviet allies. not to by other figures of the Eighth Air Force in Europe, Spaatz got his way. by Spaatz, this time killing another 25,000 people, including thousands more undocumented refugees. attacked because it was an "ideological" center, and likewise, Bayreuth and other small, ancient cities. 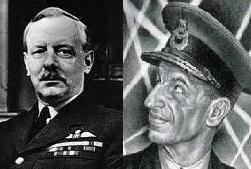 smashed once and for all, regardless of whether it is in the hands of Hitler or a Jesuit priest." Centuries old castles, cathedrals and medieval villages were needlessly destroyed at this late stage. before destroying the rest." His words fell on deaf ears and he was ruthlessly vilified. murdered thousands more civilians unnecessarily, but killed hundreds of his own men as well. small, rural towns that had not yet been assaulted and whose populations were praying for peace. animals along with 98 villagers. thousands of innocent civilians were brazenly roasted alive and forced to watch their children die. Lubeck and Bremen, all of Dresden, the Prussian royal palaces at Potsdam and countless others. utter and complete devastation which occurred in the lost German lands. among conformist social scientists and easily digested by a public unwilling to give up their heroes.